The Mustangs of Cal Poly were able to hold North Dakota State to a fairly innocuous first series this past Saturday. After an incompletion and a 1-yard carry from sophomore and Fargo native Ty Brooks, the Bison went three-and-out. Garret Wegner boomed a 57-yard punt to flip the field. Wegner would not return to the field for another punt until the third quarter. In the meantime, Wegner was the holder on six consecutive extra point attempts (PAT). Each one of those PATs followed a Bison running back finding the end zone, more often than not, untouched or breaking away from the Mustangs’ defense. Senior running back Lance Dunn got things going early, atoning for his drop on NDSU’s first possession. Dunn fielded his first handoff of the season and saw his first opening close. With exceptional vision, the Waterloo, Iowa native cut right and caught a glimpse of a second opening and bulldozed through it. Guard Luke Bacon and tight end Ben Ellefson trailed Dunn as he zipped to the goal line, admiring the fruits of their effort. While Dunn, along with Brooks and Bruce Anderson, toted the ball, it was an utterly dominant effort from the Bison offensive line that allowed for such a gaudy stat line. NDSU’s 458 rushing yards and seven rushing scores were a credit to excellent blocking from the offensive front. The Bison offensive line received a massive lift heading into Saturday’s 49-3 thumping of Cal Poly with the return of Dillon Radunz, a player the NDSU coaching staff view highly, to the starting five. Radunz’s comeback had a ripple effect on the left side of the Herd’s line. Colin Conner — who started all 14 games at left tackle in 2017 — slid to his more natural left guard spot, as Radunz is strictly a left tackle. Fifth-year senior Tanner Volson returned at center, while Luke Bacon and Zack Johnson rounded out the right side. The starting five, at a combined weight over 1,500 pounds, massacred Cal Poly’s three-man front, giving the NDSU backfield plenty of room to break free. Like Dunn, Anderson found the open field on his first carry of the season, a 23-yard scamper that set up Dunn’s opening score. On the following drive, Brooks and Anderson hit on two 18-yard carries, which led to another score from Dunn. It was the offensive line that again paved the way, as the senior stepped through untouched from a yard out. With his fellow senior hitting pay dirt early, Anderson took the reigns. On the following possession, he broke right and then bounced left, reaching the pylon before a Mustangs defender could so much as breathe in his direction. After the Bison defense again held serve, Dunn took his final carry of the afternoon into the end zone to put the Bison up 28-3. Cordell Volson made a key block in the second level of the defense, and Dunn high-stepped past a would-be tackler for another clean score. Anderson again provided an assist on Dunn’s third touchdown, rushing 17 yards on the preceding play. On just 16 carries, NDSU’s two-headed monster rambled for 164 yards and four touchdowns, an efficient onslaught that buried the Mustangs. But the Herd didn’t take their foot off the gas. After a massive blunder from Cal Poly punter Casey Sublette gifted a touchdown to the Bison, Anderson came up with NDSU’s most explosive play of the afternoon. Anderson took the handoff from Stick and darted up the middle, striding through the Mustangs’ secondary. Once free, he was off to the races, rumbling for an 86-yard touchdown. If a 25-point deficit was daunting, two scores on the first two plays of the second half were the death knell for Cal Poly. The carry was the longest of Anderson’s career, and his 185 rushing yards were also a high-water mark. Anderson set the pace for the Bison rushing attack, while Dunn led in the scoring department. Across seven ballcarriers, the damage totaled 10.2 yards per carry, a mark that bettered last year’s pace in the non-conference slaughter of Mississippi Valley State. With a 39-point lead and the top two checked out of the ballgame, the running game was ceded to Brooks and sophomore Adam Cofield. Even firmly entrenched in burn-the-clock mode, the two both accounted for dynamic carries, going for 129 yards on 19 rushes. Fullback Brock Robbins, a player whose workload head coach Chris Klieman seeks to increase had two carries for 13 yards. Seth Wilson did not play Saturday, which opened up increased opportunities for Cofield. Even the quarterbacks got in on the rushing attack. Easton Stick managed 49 yards and a touchdown on the ground, coming as no great surprise to anyone in attendance. But once removed from the game, Holden Hotchkiss engineered a nine-play, 87-yard scoring drive, which he capped off with none other than a rushing tally. 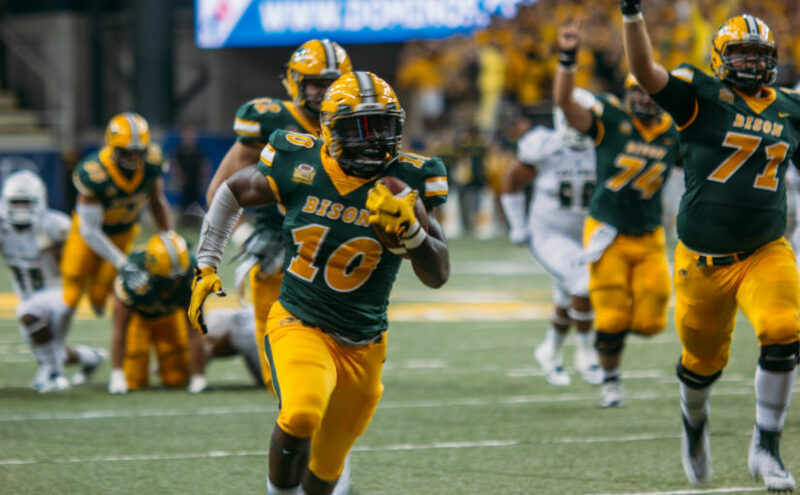 It all added up to an impressive day at the office for the Bison rushing attack and a group of running backs that figures to be one of the subdivision’s finest when the dust settles on 2018.